Facebook Messenger 4: A Better Version than previous? Facebook Messenger is one of the most successful product of the social media giant Facebook. The company recently started rolling out an important update of this messaging app. if you are a FB messenger app lover, then you'll be happy to know that the app has over 1 billion active users now. Facebook Messenger is a close competitor of the another messaging app Whatsapp, which is again owned by Facebook. Whatsapp is better known for its simplicity and become very popular in no time. But Facebook Messenger has been full of mess from the past several years with Games, News, Music, Bots and many craps. For this, the company had to release a lite version of the app which is Messenger Lite. 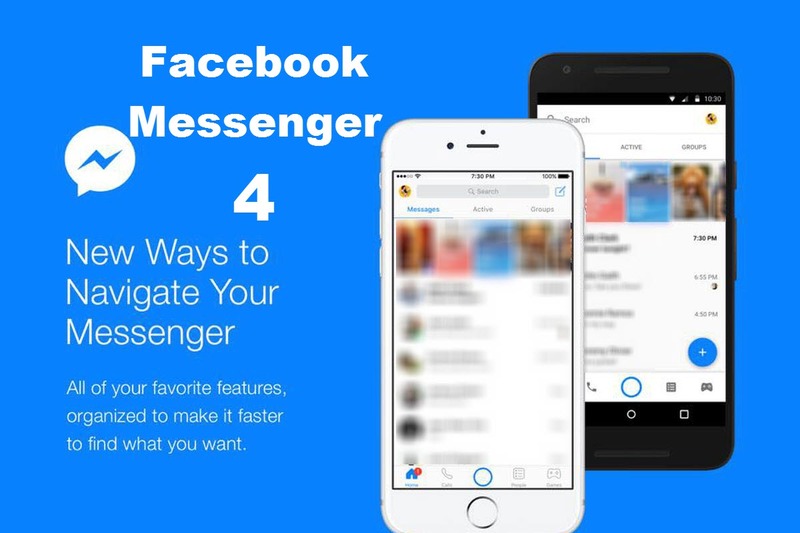 And now the Facebook Messenger 4 is on its way to hit your device very soon. Currently Facebook Messenger has many unwanted features which hardly used by most users. People like simple design over messy features on a messaging app. If you noticed, this small Messenger app contains 8 tabs. Along with all your message threads, there are tabs like Active users, Groups, Calls, Camera Shortcut, Games, Business and News threads. later introduced Your Story feature like Whatsapp and Snapchat. Now lets talk about the new upcoming Facebook Messenger 4. 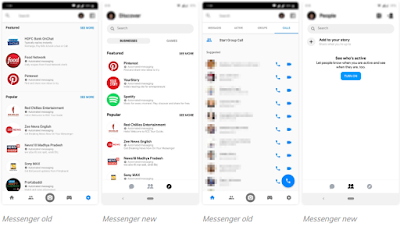 Facebook redesigned the Messenger to give a simpler look with modern design having new fonts and icons. In the new Messenger 4, you can swipe right on a chat to get options like Mute or Delete the conversation and also a menu button. You can also simply long press on the chat to get the menu button. Swipe left to directly send a picture from your camera, make voice or video call. 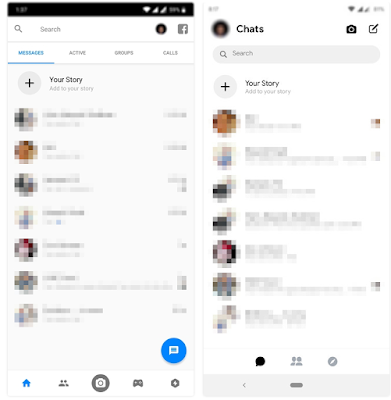 The new Messenger 4 is designed to focus more on chat and less messy. Its not that Facebook wipe off all the features to give a simple look, its simply place them to more wise place where they should be. Games and the bots are placed inside a single Discover tab. You will not find all the previous features right on the main screen but they are there. Some users may find the new design confusing but I'm sure they will soon get the new design and love it. So, I find the new Facebook Messenger 4 simple and great design than before. 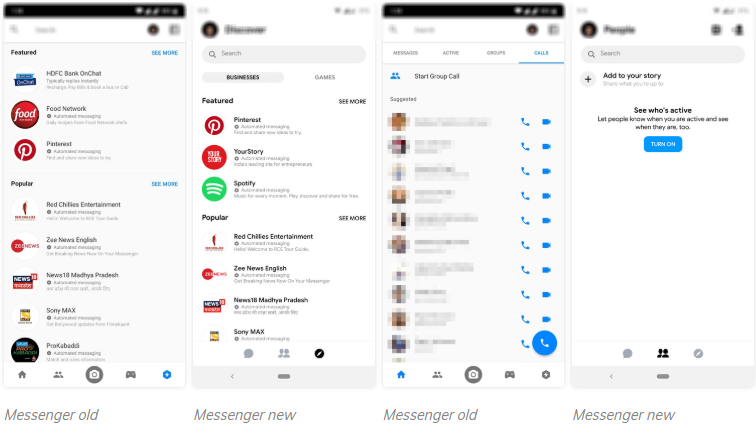 Facebook already started global rolling out of the new Messenger app and all the supported device should get the update soon. So, what do you think about the new design? Comment your opinions in the comment.